Bishop Ferran is a graduate of Trinty College Dublin and taught before training for the ordained ministry. He completed his theological studies in Trinity College Dublin and the University of Oxford and was awarded a doctorate by Warwick University. He is married to Jean who is a teacher in Wesley College Dublin and they have three children Michael, Richard and Esther, who are in their twenties. 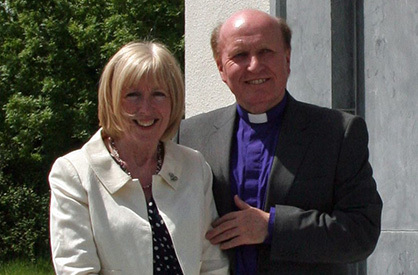 Bishop Ferran is involved in theological education in the diocese, the College of Preachers and the Church of Ireland Theological Institute. At heart, he is a pastor teacher, who is deeply committed to the ministry and mission of local churches. In the Church of Ireland he serves on the Council for Mission and Bishops’ Appeal Irish Church Missions and the Church of Ireland Evangelical Fellowship. Beyond the church, Bishop Ferran enjoys walking and is keen on sport, especially rugby,football and tennis. Bishop Ferran writes, ‘ I am constantly surprised by God who is at work in the lives of many people and parishes in our diocese. I am equally surprised by the privilege of serving God and his people in this special place, Kilmore Elphin and Ardagh’.